Browse: Home / Is gravity a social construct? Wow!…what’s this, a new Sistine Chapel? Well, not exactly. We’re talking about Brutalist Architecture at its most, well, brutal. An over-the-top mass concrete foot bridge weighing nearly 1000 tons. Like something from a post-apocalyptic totalitarian dictatorship you could imagine Harrison Ford pursuing replicants across it in Blade Runner. Brutalist architecture might not be pretty, in fact it’s invariably hideously ugly, but at least it works. As in bridges stay up. But, as the top picture shows, this one did not. It lasted a mere seven days. Which is surprising as the project seemed to have everything going for it. An all-female affirmative action team of engineers, a Cuban-American construction firm that had been sued numerous times for unsafe practices and ‘well connected’ in Miami politics (think Tony Soprano’s ‘environmental’ enterprise) …what could possibly go wrong? And you’d imagine God would have helped out as it was that unique phenomenon, a moral bridge. “We’re trying to build a bridge, not a wall“. Unfortunately, by collapsing within a week it became a de facto wall. You may well ask why the contract was awarded to such a firm. The answer lies in its being a Certified Minority-Owned business, a designation that provides major competitive advantage when tendering. Or…..it’s another way for White taxpayers to fund their own economic exclusion and dispossession. 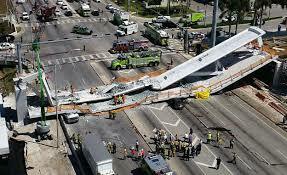 One Youtube commentator indignantly asked “was the bridge ever stress-tested to see if it could take the weight? Did it go through health and safety checks? This happened in the United States, not some Third World country“. But that’s the point. Southern Florida is the Third World, a cross between Latin America and Haiti. Steve Sailer used to have an aphorism regarding the impact of AA and the invasion from the Third World: ‘Say goodbye to bridges that don’t fall down’.